The other day I was watching Bobby Flay’s Brunch show and it was the day prior to Valentine’s Day. The whole morning line up was devoted to chocolate. Bobby created a puff pastry stuffed with Nutella and Chocolate. It comes together super fast and easy but tastes as if it was created by a Chocolatier. I made it for Valentine’s Day morning and was a little embarrassed because it was so simple but my wife thought it was the best thing ever. You get the crusty outside with oozing warm chocolate with each bite. Pair it with a glass of cold milk or cup of coffee and you have a great start to your morning. I must say the puff pastry game is pretty strong. They have really great quality dough and makes using it as a savory or sweet pocket of love super accessible. So when you are thinking of a sandwich, pie, pizza, hot pocket try a puff pastry every once in a while to change it up. I am not going to give measurements because you can use as much or as little as you like based upon your palate. For mine I didn’t use much filling but for Jill’s I packed it pretty full. 2. In a glass mixing bowl add Nutella, Chocolate Chips and Vanilla and warm it in the microwave for about 20 seconds to make it spreadable. 3. Beat an egg and wash the edges to help the dough stick. 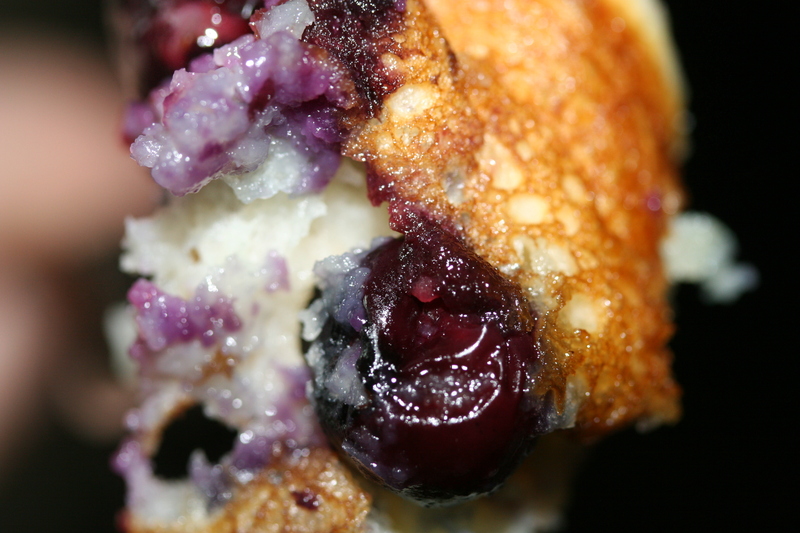 Fill the pastry and enclose it in dough and crimp the edges to make the two sides become “one”. Wash the top and cook in a pre-heated oven according to the package or until browned. I have mentioned this before, but I was blessed to grow up in a house where my Mom would make a legit breakfast for us every day. 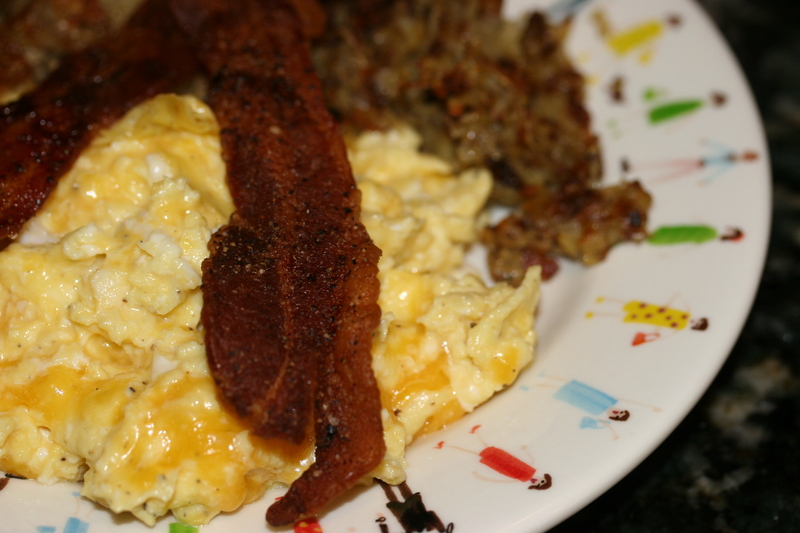 Eggs, a meat and some type of toast was on frequent rotation. 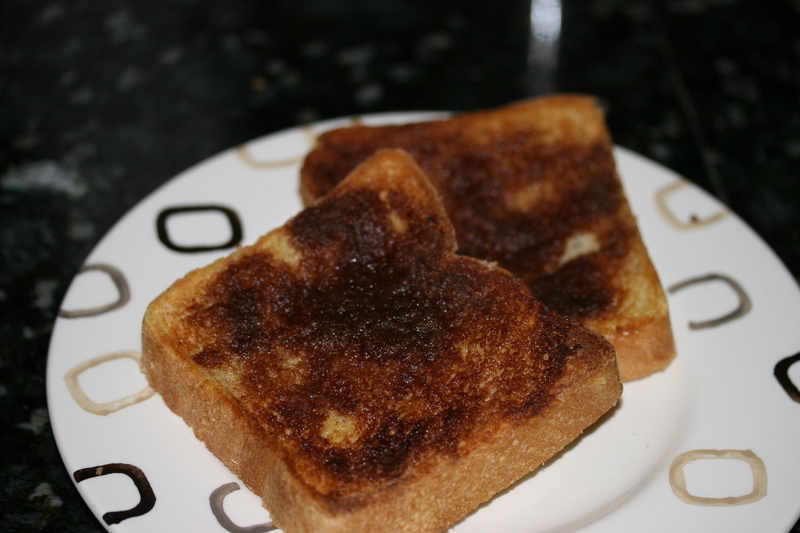 The toast is what changed… It was plain with jam, broiled with cheese and lastly the cinnamon sugar butter also broiled. The butter spots would show up in four spots where she used a pat of butter. 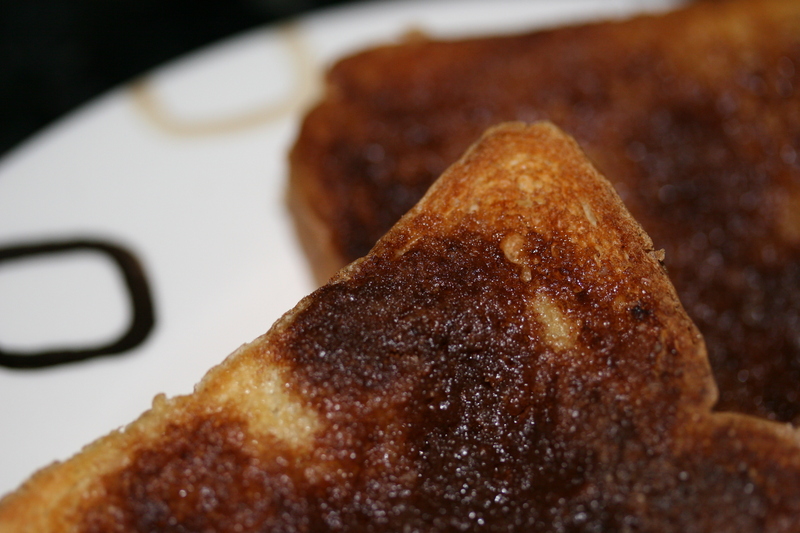 Then a sugar and cinnamon mixture spread atop the buttered bread that would caramelize into a crispy top. Since it was broiled the underbelly of the bread stays kitten soft. The butter cinnamon sugar and bread just harmonize like the Beatles. For my Texas Burger I used Texas Toast. I had a bunch of it leftover so after a few tuna fish sandwiches I was down to a few extra pieces. I thought “cinnamon” toast was a perfect Saturday breakfast paired with some proper scrambled eggs. Since Jill likes Vanilla and I had some seldom used Penzey Spice’s “vanilla sugar” I played around with the cinnamon sugar mixture. I used about half and half sugar to vanilla sugar. My mix is on the maroon side because I go heavier on the cinnamon vs the sugar. The other trick is to melt your butter so it soaks into the bread a bit before topping it with the cinnamon sugar mixture. Broil for about 4-6 minutes until it is bubbly, crackly shelled. As the school years grinds to a close so do our beloved educators. The kids get a little wilder, colleagues a little grumpier, mornings a little harder etc… So these are the months to inject a few perks to help with the grind. Food is pleasure for us so naturally you will see some comfort type food this time of year. I am just trying to keep the plates spinning a little longer. 1. Dry ingredients. Sift your flour and add your dry ingredients into a large bowl. 2. Wet ingredients. Melt your butter, beat your egg and whisk everything together. 3. Slowly whisk in the wet to the dry ingredients. Let it rest. You might need to add milk to thin it out. 4. 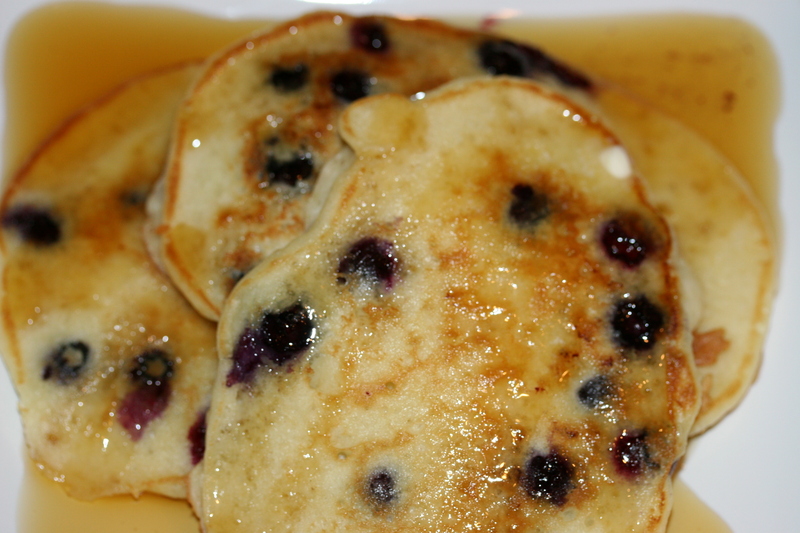 Sort out the blueberries that are not firm because they will be bleeders in your batter. 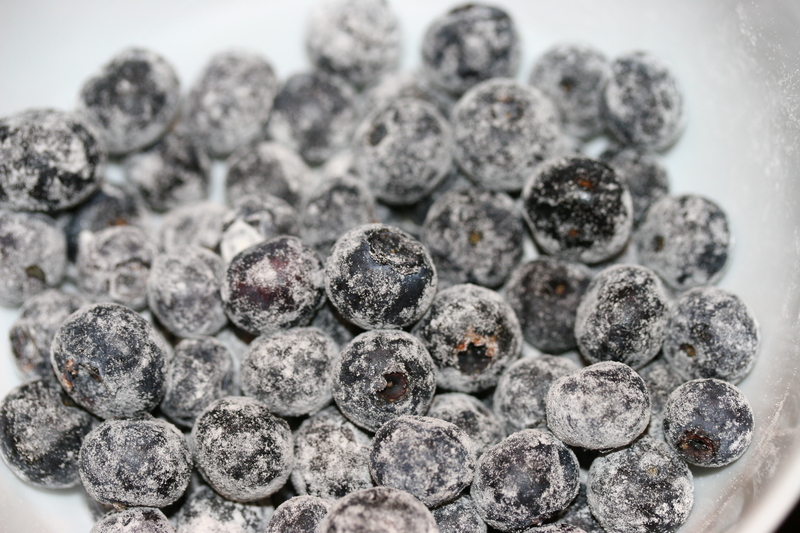 Lightly dust the berries in flour and then gently fold them in. On a buttered pan on medium low heat make your pancakes. 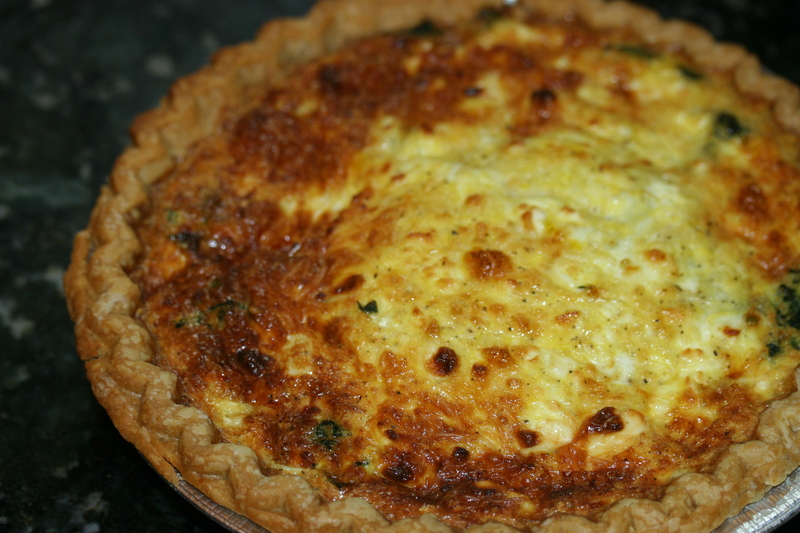 For Easter morning I wanted to make a quiche. 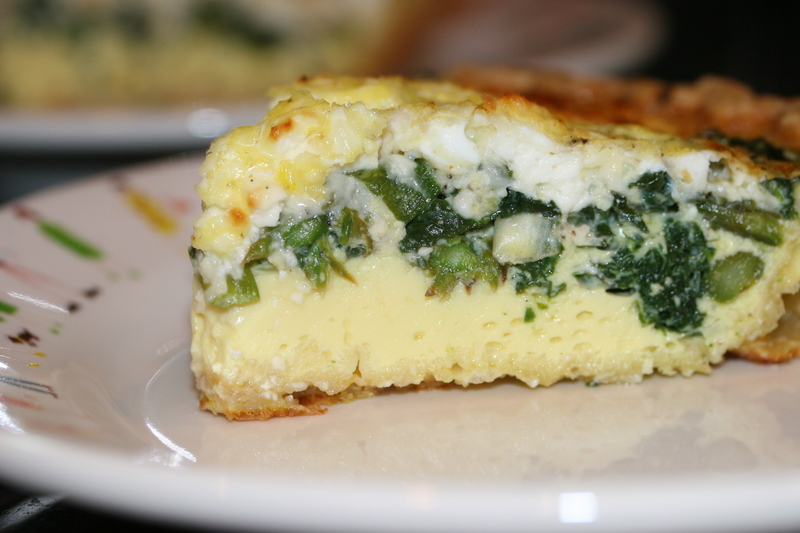 I figured it would be a two meal day and the quiche would satisfy us for several hours. 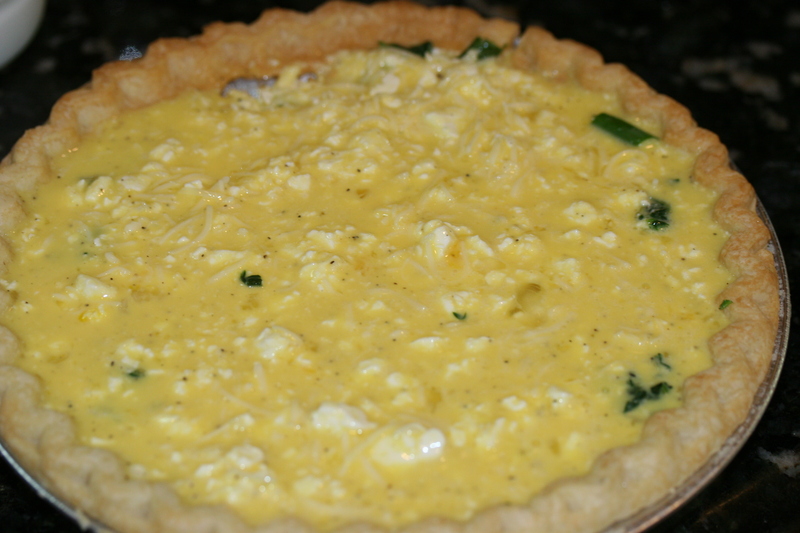 Also because I am making a ham I have several ham dishes lined up so I wanted to go more veggie with this quiche. 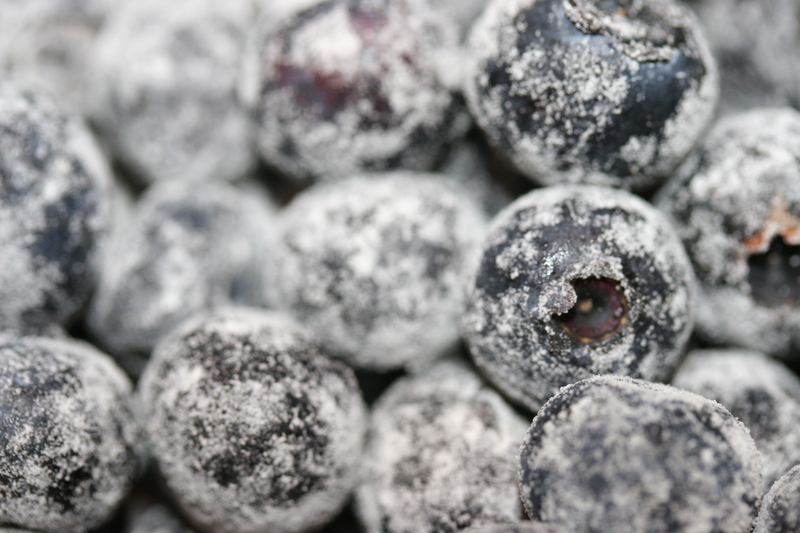 You can really use any veggies or fruits you like but just try to control the moisture content. Asparagus and Spinach were my choice. 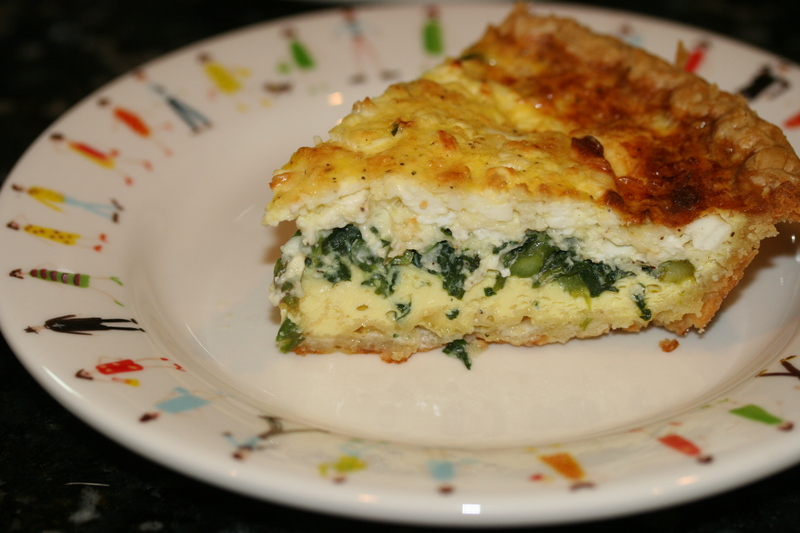 I also like using Feta or Goat cheese in my quiche. Feta holds up nicely where goat cheese will most likely melt more. This recipe was adapted by Two Peas & Their Pod. 1. 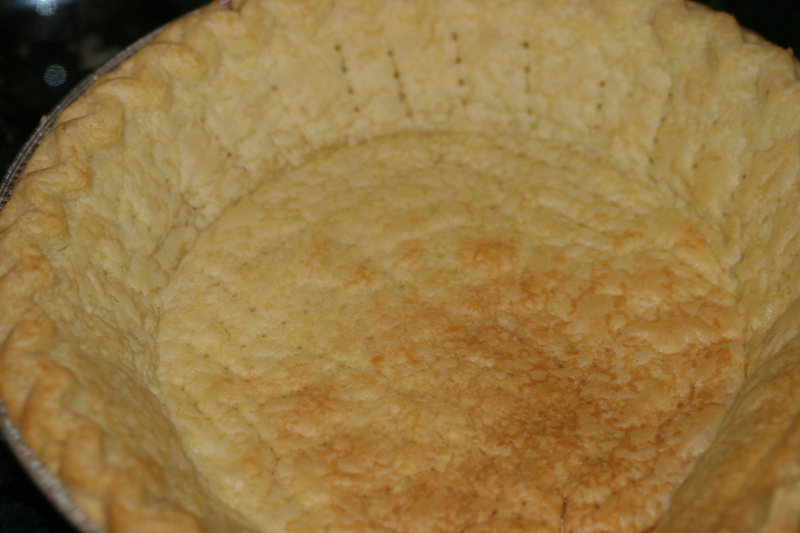 If you are using a store bought pie crust follow the instructions. You know prick with a fork and bake it for 12 minutes until golden brown. Set aside. 2. In a skillet first cook your spinach alone. Let it wilt completely. Remove and put into a towel or paper towels. Squeeze out all the moisture you can. 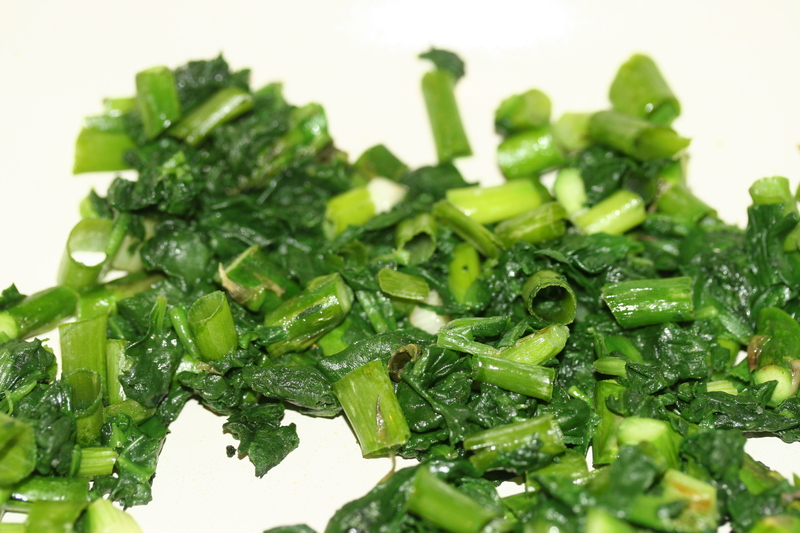 Now to that skillet add the white and light green parts of the green onion with asparagus and the cooked spinach. Dice that spinach before putting it back into the skillet. 3. 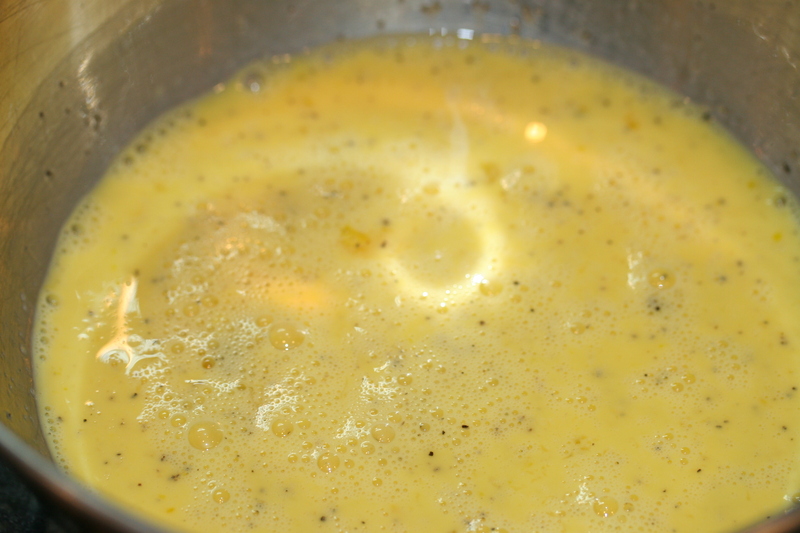 Whisk your eggs in a large bowl with the milk. Salt and Pepper (be careful because the feta is salty) Combine in the cheeses. 4. To assemble you take the baked pie crust and add the veggies along with the green onion parts now. Pour the egg, milk and cheese mixture atop the veggies. Place into a 375 degree oven uncovered. 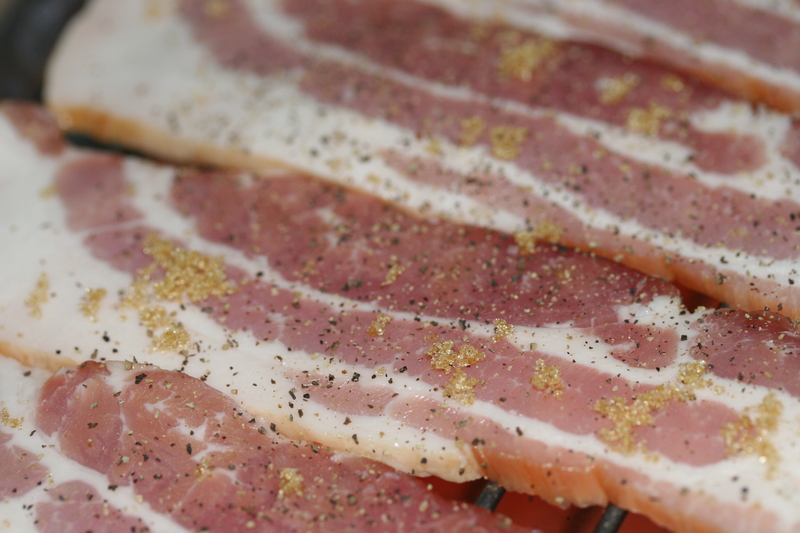 If you prefer non browned you can use foil the first 20 minutes and then remove. You want some of the moisture to dissipate. It will be puffy looking when you remove it from the oven. Let it rest for 10 minutes and it should settle. Growing up my Mom made us breakfast every morning before school. 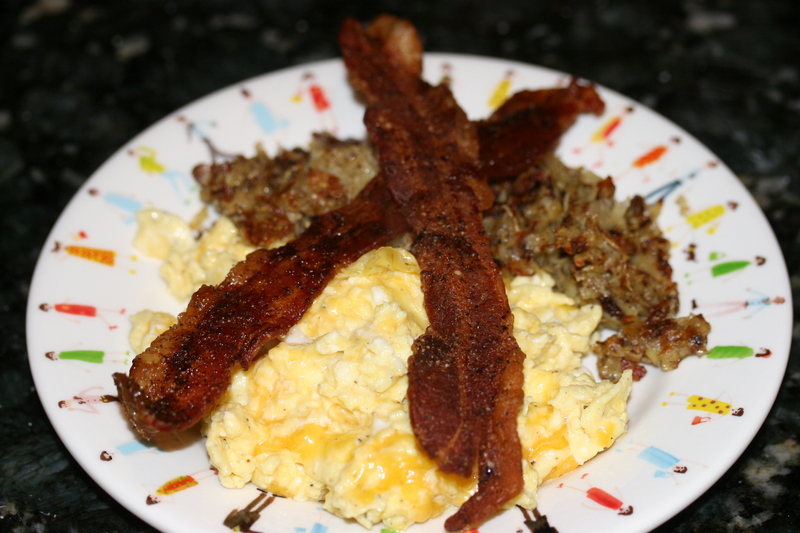 Not sure why but my Dad always called it a “sawmill breakfast” Breakfast meat, eggs, potato and some toast. A perfect way to nourish your chubby little spawn:) I do like making breakfast on Saturday’s and Sunday’s. Nothing fussy but more substantial than your average morning rise. 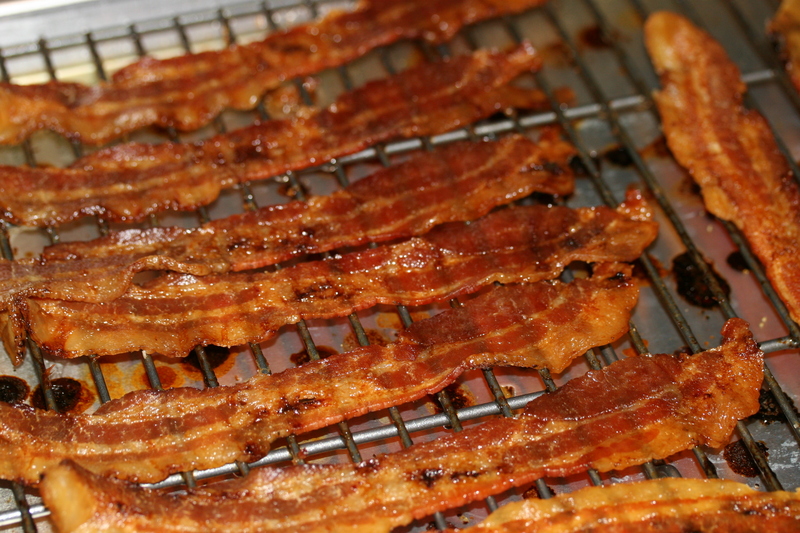 We started cooking bacon like this a few years ago. 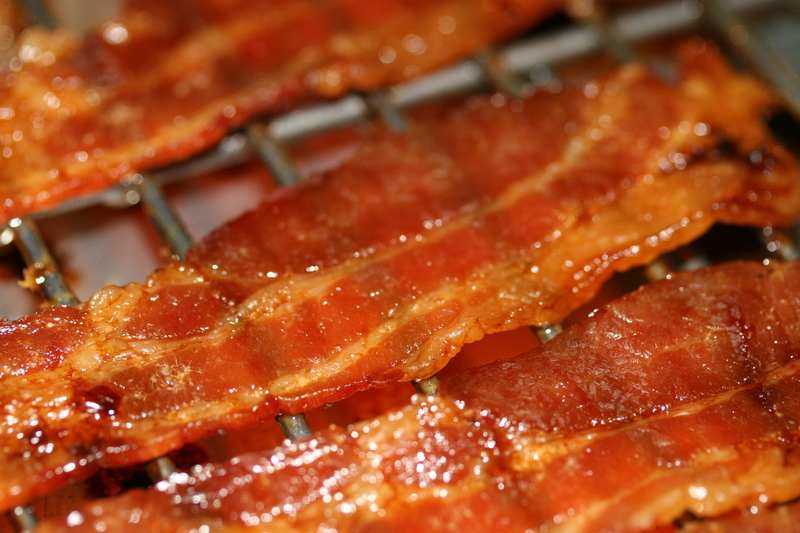 If you are a crispy bacon person this is your technique. First off you must go low and slow to render that fat out over time. It also lays down perfectly flat. I use a 300 degree oven and arrange them on a wire wrack atop a sheet pan. Today I topped it with a touch of brown sugar and cayenne. So divine and you can keep some for use later in the week. 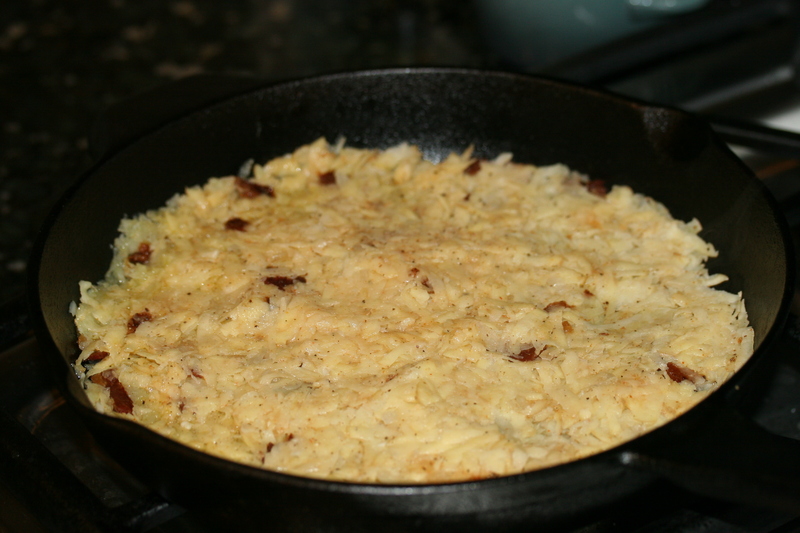 I also had three small potatoes left over so I thought I would make a potato hash thing. Frankly it sucked. I grated the potato and about half an onion and even crumbled in a touch of bacon. The potato itself wasn’t made for this and I didn’t like how it turned out. 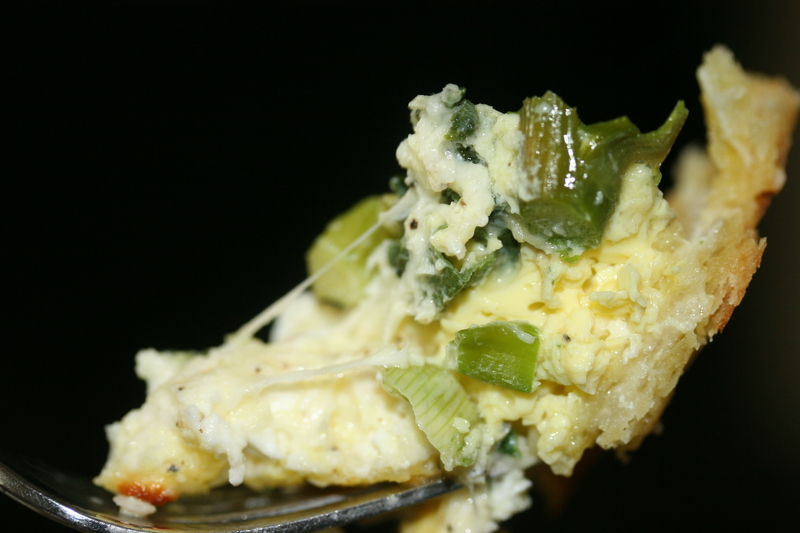 And finally the cheddar eggs with a touch of sour cream for some tang. Really there is no recipe to share other than the bacon above. I wouldn’t pass along the potato trash I created. When I see “best” on any recipe, I am torn between “yeah right” and intrigue. I mean what if it really is the best ever? What if I miss out? So I was on Yummly trolling for some recipe ideas the other day and spotted the “best buttermilk pancakes” posted by the Smitten Kitchen. 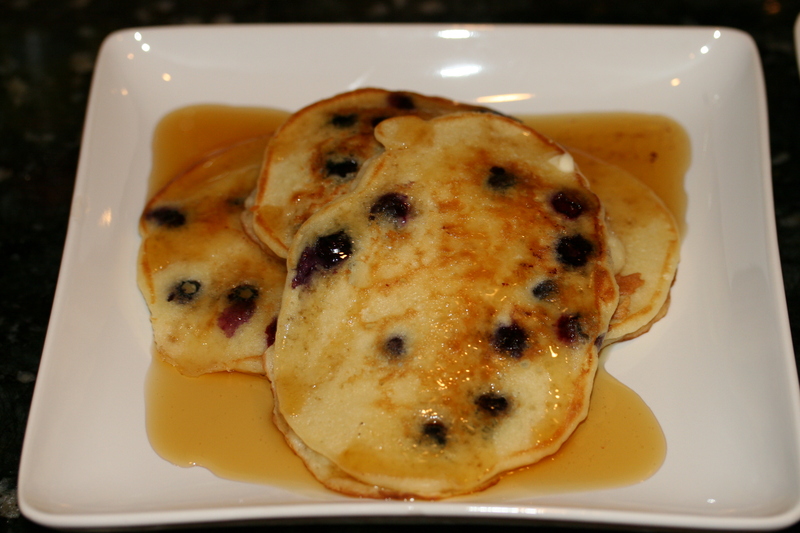 While I wasn’t looking for pancakes I did know I was going to make some for Jill on the weekend so decided to give it a try. 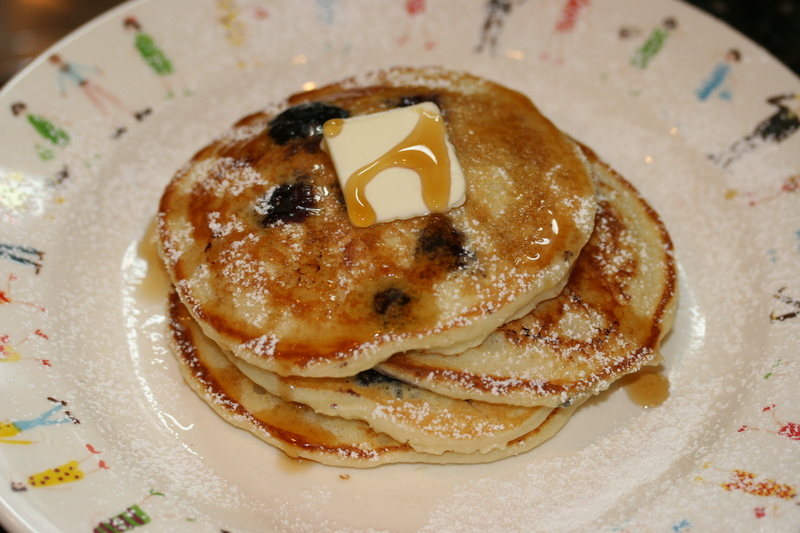 For some reason pancakes recipes all are very similar but yet these special differences make people peacock over “their” recipe. 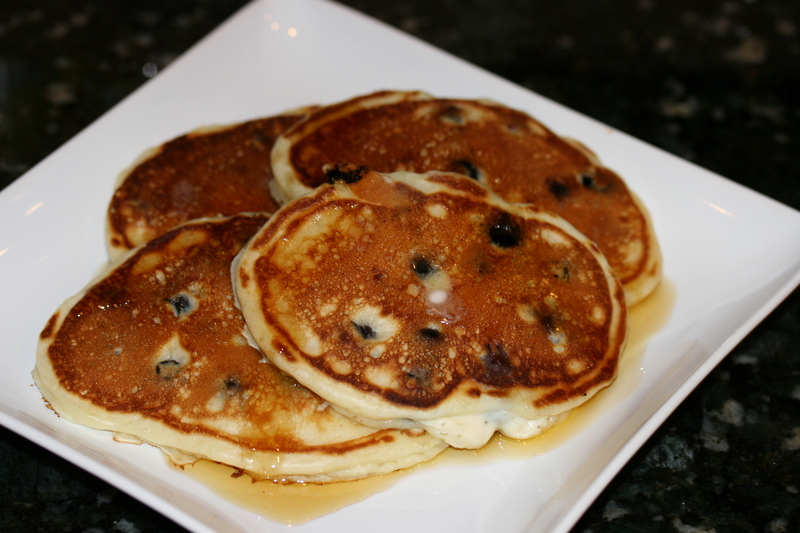 These are good pancakes no doubt. They are somewhat fluffy vs chewy or dense. 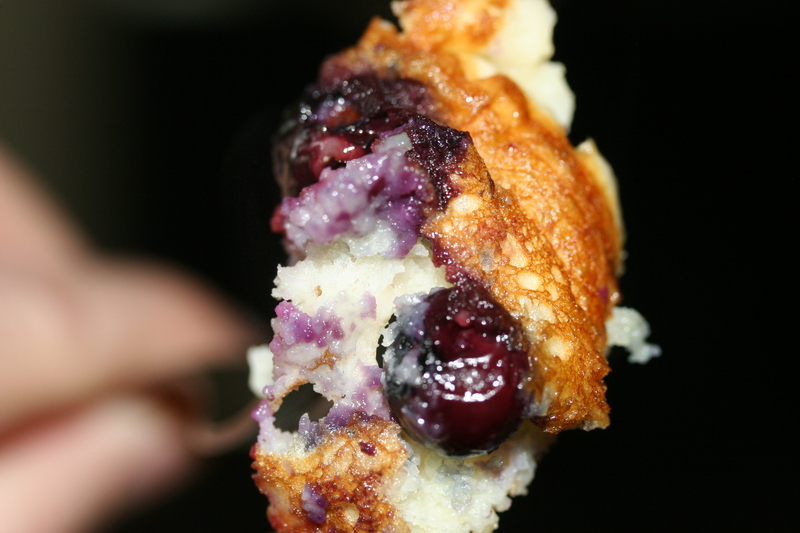 I added some blueberries and a little lemon zest and the flavor was bright. Like Spring in your mouth. 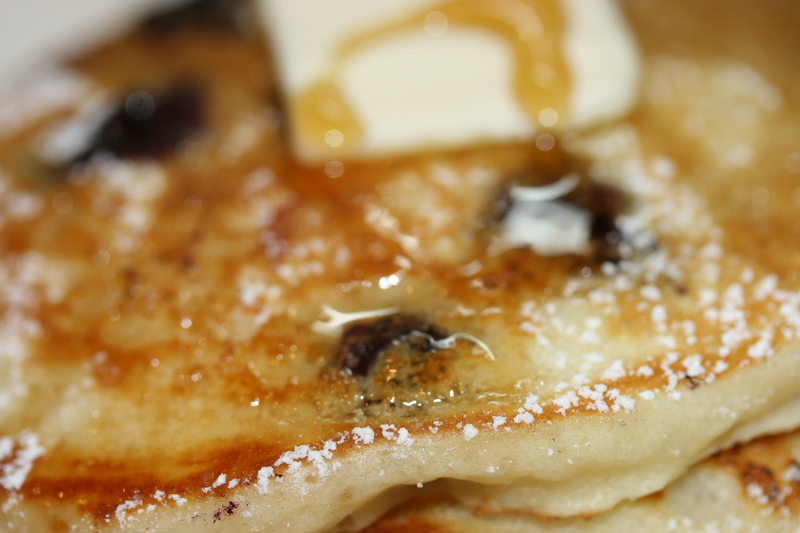 Solid pancake base recipe. 1. Pour your dry ingredients into a mixing bowl and mix well. Sift if you must. 2. Add your wet ingredients and mix well. Set aside for 20 minutes or to let the baking soda and powder do their thing. 3. 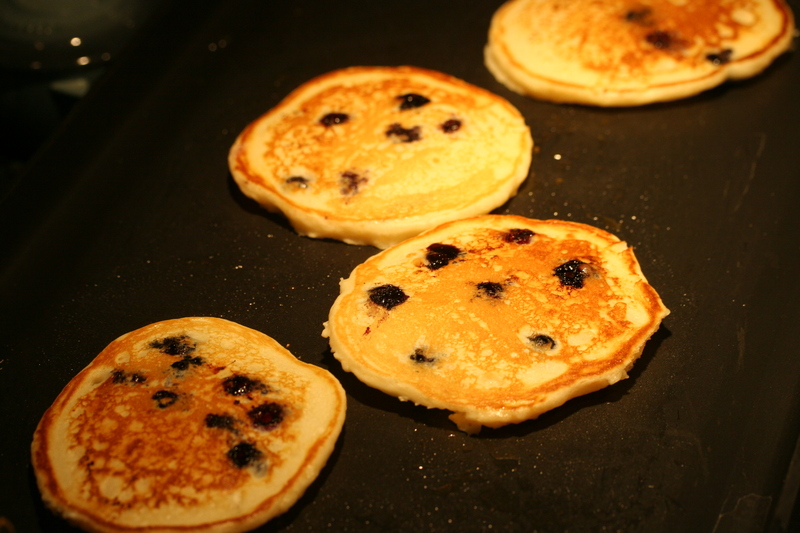 Right before putting them on the griddle fold in your fresh blueberries and lemon zest. 4. Using a large (sprayed) cookie scoop place each cake on the griddle that is medium low heat blessed with butter. Depending upon the heat watch for bubbles and the edges to turn light brown before the flip. Flip with confidence…one fluid motion. Enjoy with coffee, tea, OJ, milk or a protein. 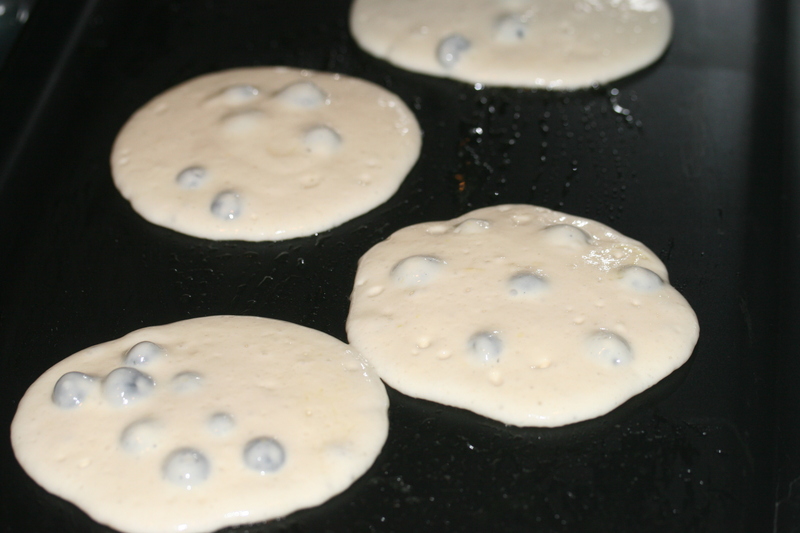 Caution: If you are serving these to kiddos, please be aware that the blueberries get really hot on the inside. I would let them sit for a few minutes. 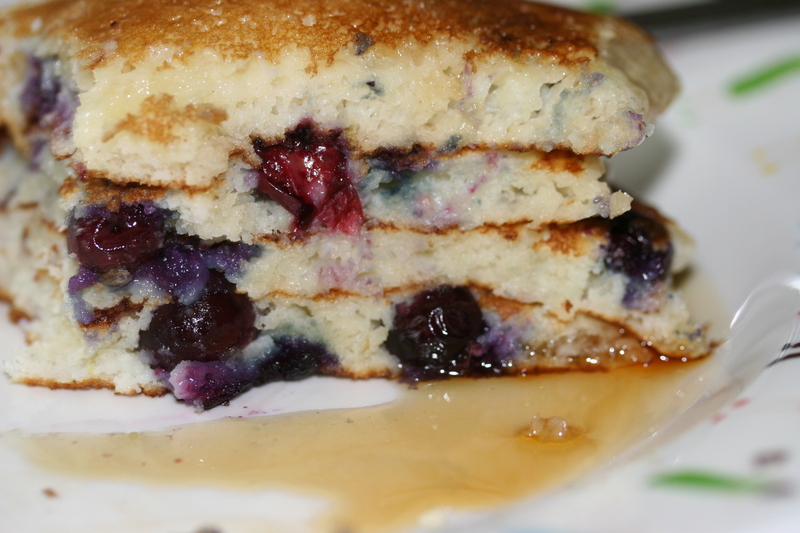 I know we all like “hot” cakes but those blueberries might burn some little hungry mouths.